Another one of those documentaries that doesn’t seem like it could be possible. 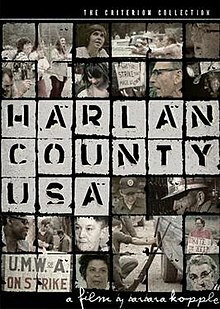 “Harlan County USA” is tough to watch, a series of snapshots of an America that no longer exists, and that–when you look at the dates of the events, early 1970s–you cannot believe was so recent. Quite simply, this movie showcases (without any narration, and without very many title screens) a coal miners’ strike in West Virginia, giving us a look at the terrible working conditions, the terrible living conditions, the harassment and violence (including one young man who is shot dead) at the hands of the “company men,” and ultimately, the utter disregard by the mainstream media. It’s the sort of story that you watch and you say, “Well, things would be different now. CNN would be there in a heartbeat.” And man, I hope so. Because the mines in West Virginia apparently claimed more than 200 lives a year, and the miners here are protesting for safer working conditions and their lives are destroyed for attempting to do so. Men on the picket line literally run over by “scabs.” Men shot at by machine guns. Men killed for striking. Unbelievable stuff. Like I said, tough to watch. Spend fifteen minutes with this movie, and you want to start crying. That sad, sad mountain folk music doesn’t help, either.